Dan has been a licensed journey-level electrician for some 17 years. He has extensive experience in most areas of the electrical trade. 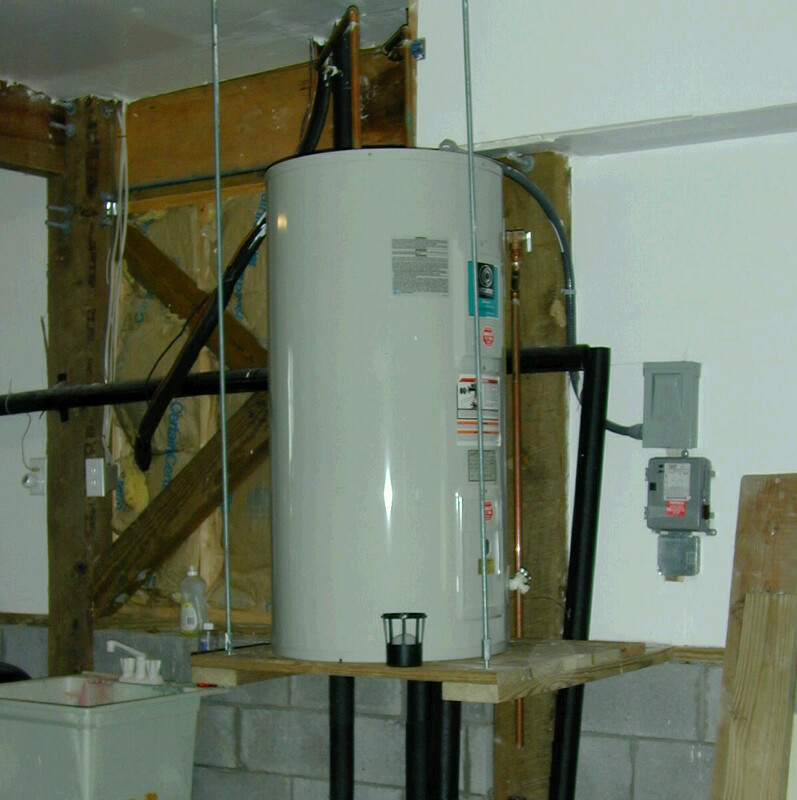 Sooner or later every hot water tank will fail and it is time to replace it or troubleshoot and repair it. Unless there is physical damage resulting in leaks the problem will be in either the thermostat or heating elements; these are simple appliances and there just isn't very much that can go wrong. 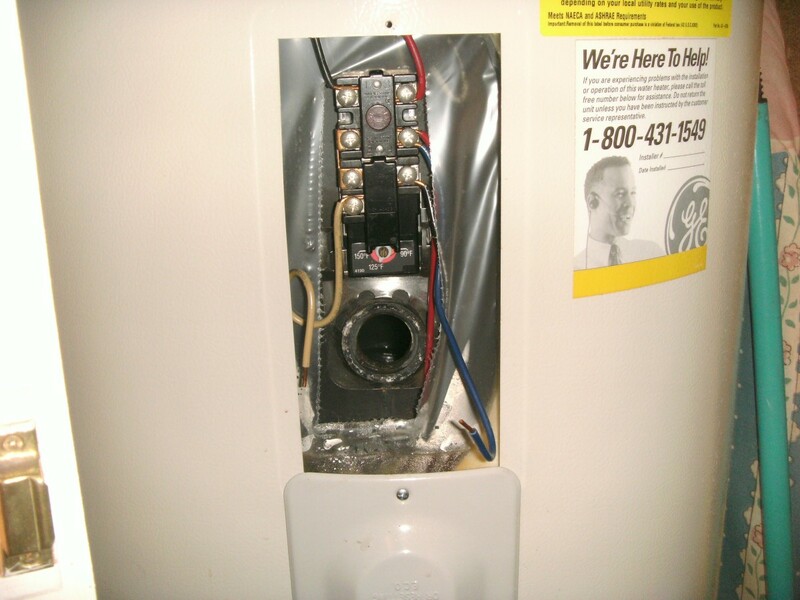 Nearly all residential hot water heaters have two thermostats and two heating elements. In normal, low water usage conditions, the lower element is the one doing the work. It is only under high water requirements that the entire tank will cool down; the lower element will then shut off and the upper element takes over the load. This heats the upper portion first and produces a quicker recover time. Troubleshooting these parts is not difficult, but does require working around live, high voltage wires and connections. If you are not comfortable doing this, it is probably best to simply replace the entire unit or call a plumber. Or simply change parts without troubleshooting them; elements and thermostats are inexpensive enough that all four pieces could be changed and still save over half the cost of a new water heater. 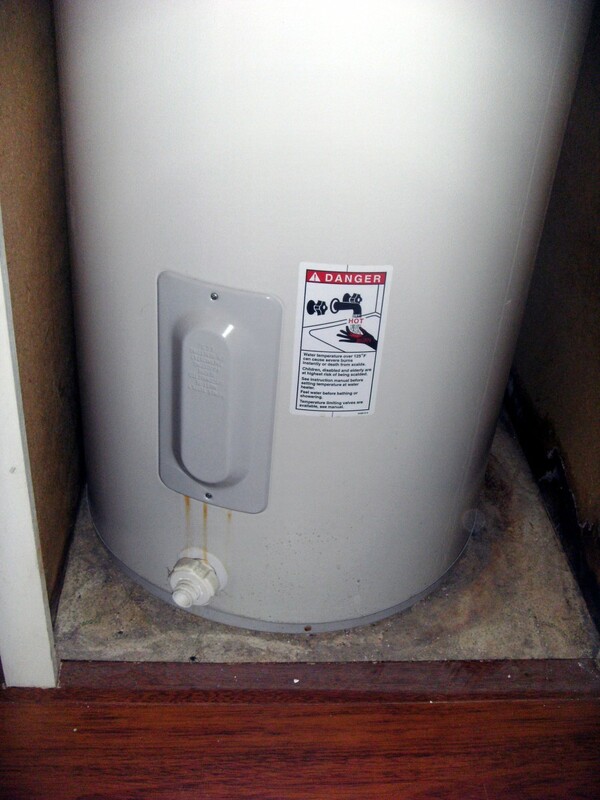 The first step in troubleshooting a hot water heater is to gain access to the areas to be tested. As you will need to get your fingers into the area occupied by hot electricity; turn off the power at the breaker panel. It will be a two pole breaker; that is, two breakers will be connected by a bar and will turn off together. Once the breakers are turned off, remove the two access panel covers shown in the photo to the right. You will find insulation inside, but it is cut to the size of the opening; pull this out and set aside for later re-installation. Now exposed is the thermostat and heating element, covered by a simple plastic cover. The top thermostat has a built-in circuit breaker button accessible through the plastic cover; push it and make sure it wasn't tripped. If you feel a "snap" or think that it had tripped you might turn on the power again and give it time to heat the water - this could have been the whole problem, although the question of why it tripped at all has not been addressed yet. If you continue to troubleshoot it would be best at this point to check that the power is indeed shut off by using a non-contact voltage detector if one is available. The only wires that you are assured of as being hot are the pair at the top; wave the detector in that area to see if it lights up or beeps. 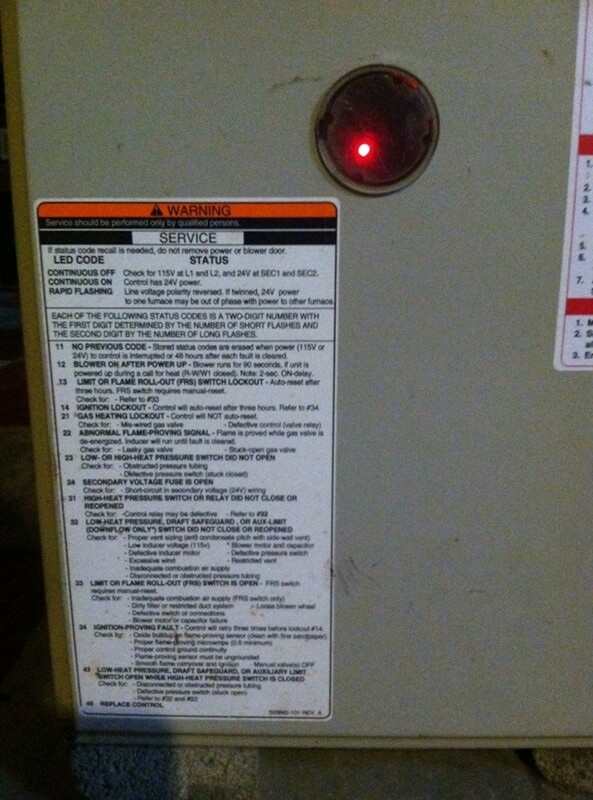 Whether you have checked voltage or not, assume the unit is still powered. Carefully remove the plastic cover; they will usually either simply snap out or will need to be worked out from under a hold down support. Do not stick your fingers any further into the opening than is absolutely necessary! With the cover out of the way check for voltage at the top two screws by setting a voltmeter to a voltage setting of at least 240 volts and putting one test lead to each of the top two screws. If voltage is detected the power is not turned off yet; turn it off and re-check. Only when the power is turned off should you continue. See the photo for location of the heating elements. These are vaguely round, with a large hex nut behind them. There is one behind each access door, and each one will have two wires going to it. Remove one of the wires from the heating element and test for resistance (ohms) by setting the meter to the lowest resistance setting available. With a test lead on each wire terminal of one of the elements, read the resistance; it should be around 12 ohms for a common 4500 watt heating element. If the meter shows OL (overload) or infinite, the element is broken and needs replaced. If the reading is very low, perhaps just an ohm or two, the element will probably not last much longer and you can expect to replace it at any time. Next test with one lead on the metal tank itself and the other on one of the terminal screws. The reading should be infinite, or OL. Repeat for the other terminal screw. If either of these readings are anything but infinite the element needs replacement. If either element needs replacement make sure you purchase one of the correct wattage and voltage. 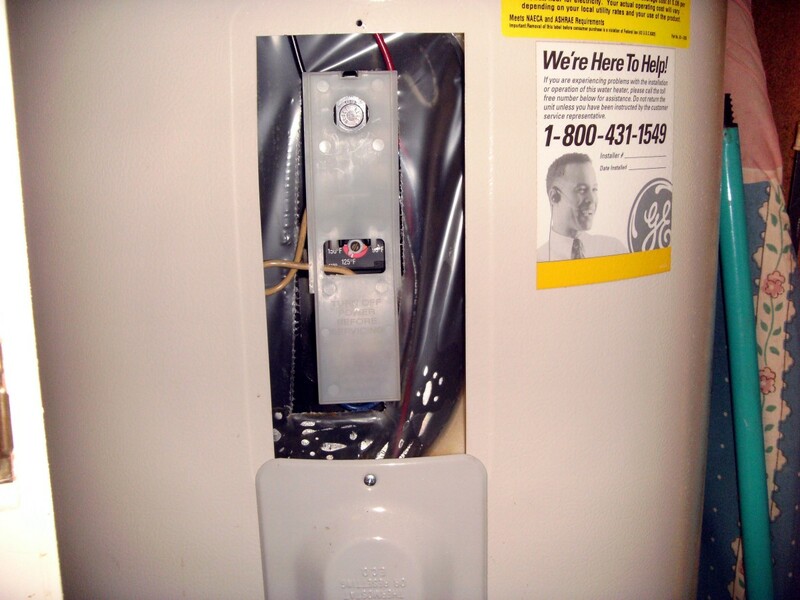 Troubleshooting thermostats in a hot water heater requires that the power be turned back on. This will supply 240 volts to the heater; if you touch any bare wires or terminals you will receive a severe shock that can be deadly. Extreme caution is required! 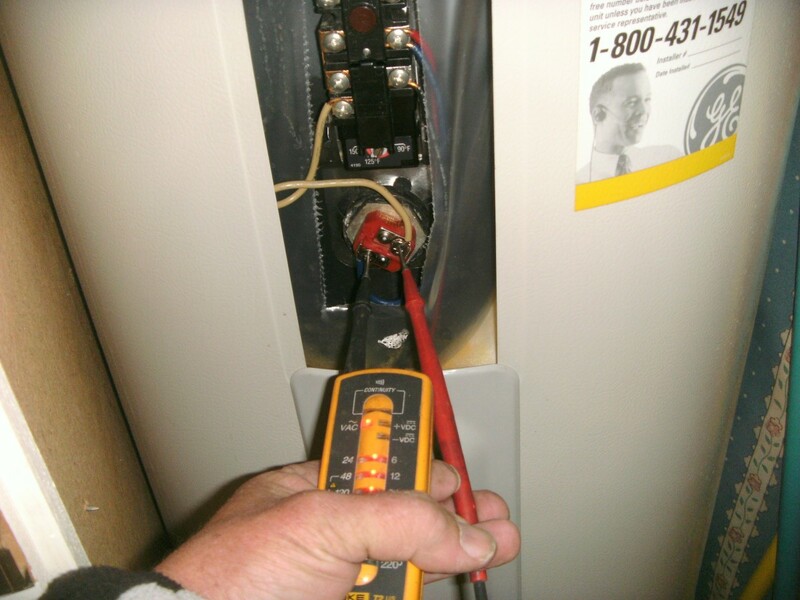 Test voltage at both heating elements by putting a test lead to each wire terminal, one element at a time. 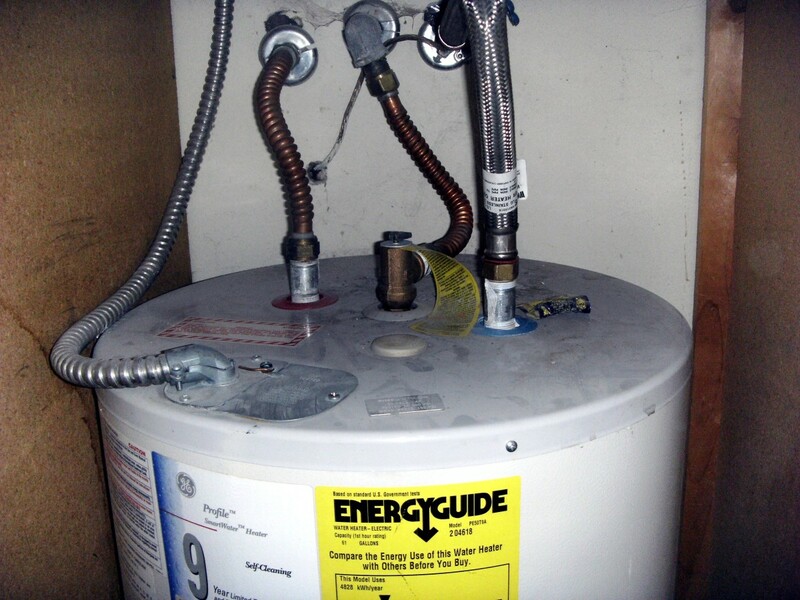 There should be no voltage if the water in the tank is hot; if it is not allow some time to heat up and re-check. If one or both elements are "hot" even with hot water in the tank one or both thermostats need replacement, but it would be unusual to fail in the "on" position and the result would be water escaping from the safety valve at the top of the tank. More likely the water just isn't hot yet; give it some time. Once both elements are "off", proceed with the next step. With hot water in the tank check voltage at the lower thermostat by putting a test lead on each of the two screws on that thermostat. It should read 240 volts; if it does not the upper thermostat is bad and needs replaced. Turn on the hot water in a sink or tub and check the lower heating element every couple of minutes. As hot water is drained from the tank it is replaced with cold water, and the tank will eventually become cold enough to turn on the lower heating element by applying voltage to that element. If the lower element never comes on the lower thermostat is bad and needs replaced. Continue to run hot water in the sink. As the water in the tank continues to cool, it will reach a point when the lower thermostat shuts off and the upper thermostat turns the upper heater on. Continue to check the upper heating element for voltage - it may take quite a while and the water may have to quite cold, but it should come on eventually. If the upper element never comes on even though the water running in the sink is quite cold the upper thermostat is bad and needs replacement. The lower access panel, along with the drain valve right at the bottom of the tank. Access panel removed, showing insulation inside. 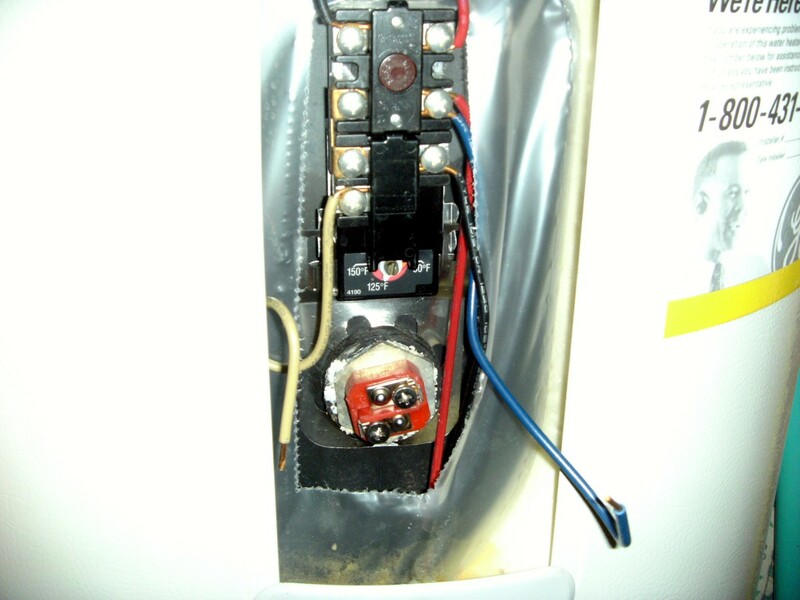 Insulation pulled out, revealing the thermostat and heating element covered by plastic cover. Plastic cover removed, leaving the upper thermostat and heating element. Note the adjustment screw at the bottom of the thermostat. This heating element is the red colored square with a silver hex nut around it. at the bottom of the opening. Testing voltage at the heating element This element is hot, with 240 volts although the camera doesn't show it well on the meter. Whether it is elements or thermostat that needs replacing, turn the power off and check that it is indeed off. The tank needs to be drained; attach an ordinary garden hose to the drain valve at the bottom of the tank, lead the hose outside and open the drain valve. The tank probably has sediment it, wait until clear water is coming from the hose and turn off the water supply valve to the tank. Water will not drain this way; either open the pressure relief valve on the tank or turn on the hot water in a sink. Either one will let air enter the tank and allow the tank to empty. This can take an hour or more - be patient and let the tank drain completely. Elements are generally too tightly screwed in to loosen with pliers, and a large socket wrench will be needed; by far the most common size is a 1½ inch socket. This is not an item common in most homeowner tool kits and one may have to be purchased just for this task, but it is far cheaper than hiring a plumber or replacing the entire hot water heater. If you already have a ½" drive socket set you may need just the new socket and an adapter to fit the smaller drive but if not you may need to purchase a "breaker bar" to go with the socket. Remove the wires to the heating element and, using the 1½ inch socket, unscrew it an remove it from the tank. Make sure there is a rubber gasket on the new heating element and screw it into the tank. It may be difficult to get started as the end inside the tank is heavy and it will tend to tip down. Make sure you don't "cross thread" it as you start the threads into the hole. Screw in a few threads by hand before using the socket wrench. Tighten securely and refill the hot water tank with water. Be sure and leave the hot water turned on in the sink until water, not air, comes from the faucet. If the power is turned on without the tank being completely filled it will promptly burn out the new heating element; these elements are not designed to operate in air, but only when completely submerged in water. Check for leaks around the new heating element. Giving it some time, verify that the tank is operating properly and producing hot water. Turn the power off and replace the thermostat covers, insulation and access panel covers. Turn the power on for a final time. The hot water tank need not be drained for this operation but it is easy to forget where the wires go, particularly on the upper thermostat. Take a photo or draw a picture of where each differently colored wire goes or mark the wires themselves. Remove all the wires, followed by the thermostat itself. Mount the new thermostat the same way the old one was secured, and re-attach all the wires. Adjust the temperature according to directions on the new thermostat - a good setting is 120° on the upper thermostat and 110° for the lower thermostat. Check and set both even if only one was changed. Turn the power on and, giving plenty of time, verify that the tank is operating properly and producing hot water. 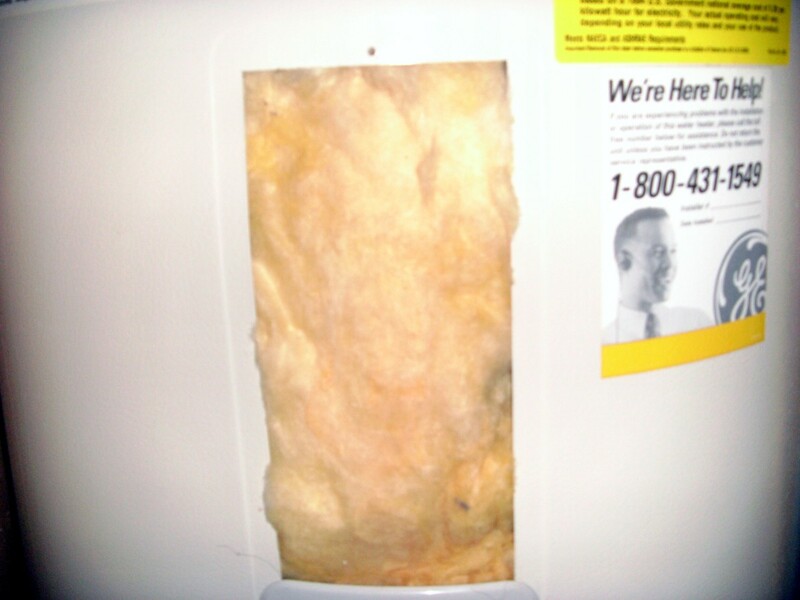 Turn the power off and replace the plastic thermostat covers, the insulation and the access covers. Turn the power back on for the final time. Troubleshooting hot water tank heating and elements, along with replacing any that are bad, isn't a particularly difficult task. A voltmeter, a phillips screwdriver and maybe purchase of a large socket wrench can save a plumbers call. Learning to do simple home repair tasks can save a world of hassle with contractors and a good deal of money. The heating element has been removed, leaving a hole and two wires behind. 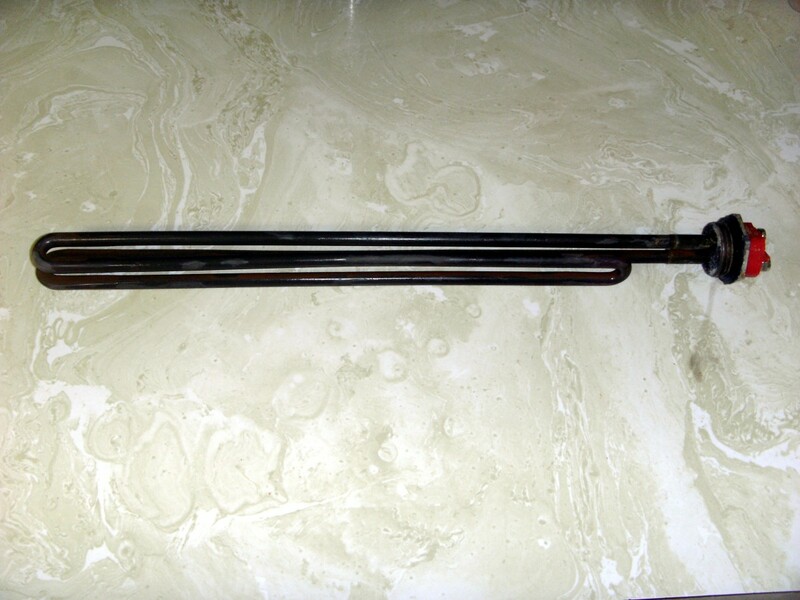 A used heating element. Although discolored it is still quite serviceable. I'm trying to repair my water heater. I changed both elements and both thermostats. The water will be hot for 5 minutes and then goes lukewarm. I double checked the thermostats and elements and all have an adequate power supply. What else could cause this to happen? I have no hot water at this time. I've already replaced the elements of my water heater. Do you have any suggestions? Check the incoming voltage to the heater. If present, check the before and after thermostats and replace as needed. I keep having to push the reset button to get hot water each day. I have replaced the bottom element and the upper thermostat. Any suggestions? Possible problems could be the other element or thermostat. It is faintly possible that a poor connection is requiring more current than it should, and that could go clear back to the breaker panel. You might try reducing the temperature some as well, although that, too, is unlikely to be the answer. How long does it normally take to change all the parts of a thermostat, alone? We have replaced the lower thermostat and element and still no hot water after 6 hours what could be wrong now? If the power is turned back on, check both elements for voltage at them. If they have voltage one or both are bad - even brand new elements are, very occasionally, bad. I have replaced both elements and thermostats, and the hot water only works for a day before stopping again the next. What could be the issue? You could have a short somewhere that is blowing the breaker, or a circuit that is too small for the hot water heater being used. Ok, I've been a contractor for some time now. However, this one has got me stumped! I've got 120 to all four element screws. Both of which are new as well as the thermostats. I replaced them all at the same time. I still don't have hot water, the breakers are not tripped, and neither is the reset button. There are no leaks, and I bled out all air from the lines and tank. I have new Pex plumbing, the valve is on, and there is plenty of pressure. Please, what am I missing? You're stumping me, too. All I can think of is that the thermostats are set too low - they are turning the elements off before the water is hot. Which almost certainly means you would have warm water, if not hot. You don't have a large hot water leak somewhere, do you? Constantly draining the hot water tank? We have a Rheem gas water heater that's only two years old, but the cold tap water comes out warm no matter how long we run it. We lowered the heater temperature, but it only helps a little bit. What could be causing this? If the cold water is coming out warm, it is entering the house warm, or there is a cross connection somewhere between the hot water tank and the cold water lines. If the hot water heater is leaking, does it need to be replaced? Depends on where the leak is. If it is at the pop off valve at the top or the drain valve at the bottom, these are replaceable. If it is at a heating element, a new element might solve the problem. Anywhere else indicates a cracked tank and it will need replacing. We have replaced the upper and lower heating elements along with the thermostats. The water gets so hot the tank whistles and we’ve turned it down as low as we can. Do you have any suggestions? Seems like all we do is overheat the hot water heater and the water is boiling. If both thermostats are turned down, either the wiring is improper or one thermostat (or both) thermostat(s) is bad. We replaced our elements in the water heater, but I’m still not getting much hot water. Can you explain why? Check both thermostats for a reset button, as well as the voltage on each thermostat to make sure they are both working. Then, make sure that the temperature setting is reasonable. Lastly, re-check the wiring. Does the lower heating element need to be changed if hot water just doesn't last as long? That is a likely possibility. The article tells how to check that element, though, before a new one is installed. I had water come thru my upper thermostat can you tell me what went wrong? What do I have to replace? If you have water coming out of the thermostat you will need to replace the thermostat at a minimum. Once it is out (and possibly the element as well) you can make a determination if the entire water heater needs replacement. 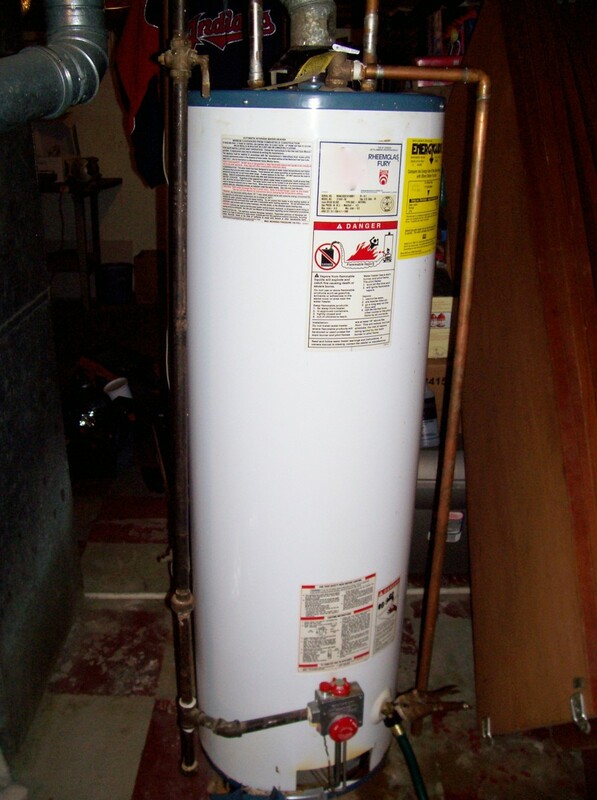 I have a brand new Bradford 40 gallon single element water heater. I installed the heater exactly as I should have, and filled it all the way up with water. I then turned the breaker on. I waited and waited, but it never heated the water at all. I tested the element and thermostat, and it had power and the correct amount. What can I do next? I have read something about the thermostat calibration. If the element has power to it, then it should be heating. But you can check the temperature setting (most are set too low from the factory, IMO) and the reset button on the thermostat. I think the plumber inadvertently shorted out the new thermostat. It was humming when he left, but a couple of hours later it was cold again. I looked up a diagram online, and it looks like he swapped the red and black wires. Would that fry the new thermostat? How much do the thermostats cost? Thermostats on Amazon run from around $10 to $20. It will depend, of course, on which one you need. Our hot water comes out burning hot. An electrician came and replaced the element and then we had hot water which was still burning hot. Within 6 hours no hot water and the electrician says now there is no power to the hot water tank. What would cause this? He has now told us to contact the power company. However, they came to check before the electrician replaced the element and said there was power to the tank. It sounds like the thermostat on the heater is bad and needs replacing. 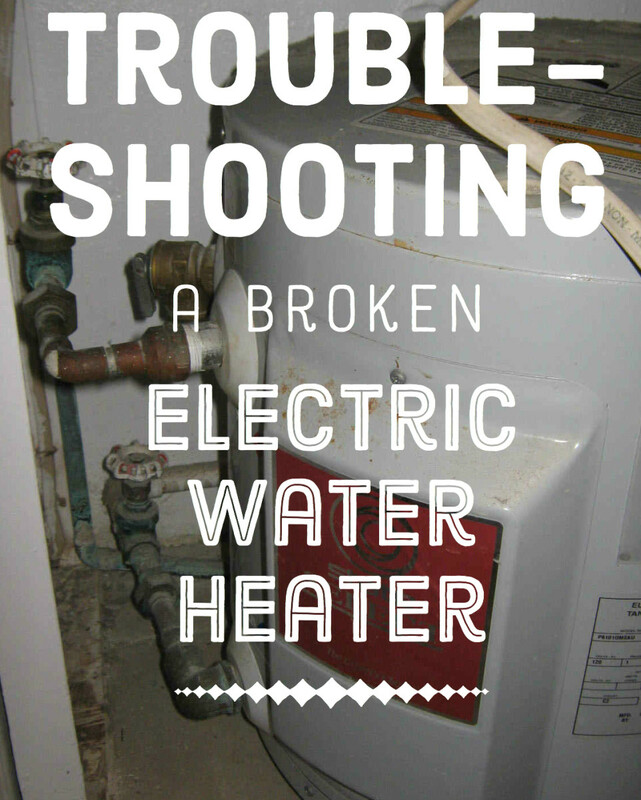 If there is no power to the hot water tank the most likely reason is a blown breaker. Why is my water not coming out of the faucet after I replaced my hot water heater? Did you turn the water back on going into the heater? Did you leave any plastic plugs in the connections to the heater? Did you turn all the water to the house off and forget to turn it back on? My water heater is electric and in the top where the electric comes in I found water and rust. Is this normal condensation? It is 10 years old but water and electricity do not mix. Sounds like your safety valve may be leaking a small amount. You might try letting it cool, turning the water off, and opening that valve a few times by hand, or even just cracking it open while warm and with water pressure. It should let hot water out and shut back off completely. My water heater stopped working. I replaced the thermostats and it was working for a day. Now it is not. Could that be because of a heating element gone bad? Yes, that is quite possible. Instructions are given in the article on how to test those elements. Is the thermostat at properly? Do the elements receive power? Sorry, but I'm an electrician, not a plumber. If the fire is burning but water isn't getting hot enough I'd replace the thermostat myself. But it's only a guess; the fire could be too low, burning improperly with a bad gas/air mix or it could be something else yet. 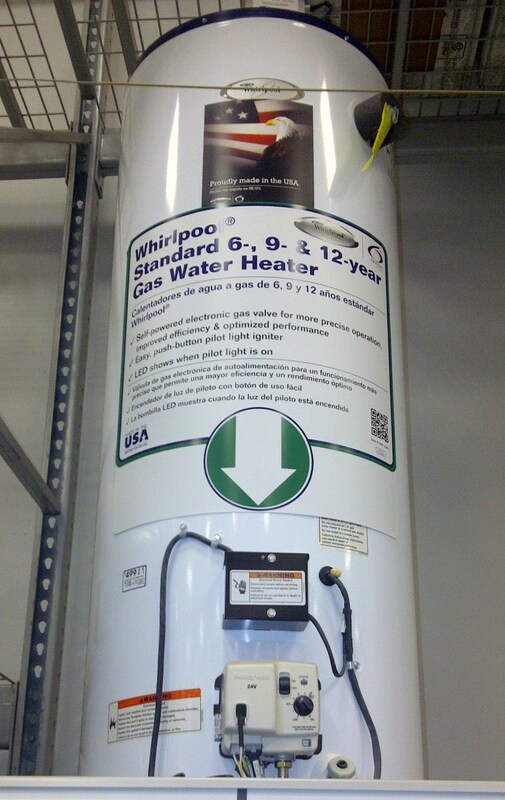 I have a GAS water heater. I have turned up the thermostat. Still not real hot. What can it be? The thermostat isn't letting power go through. It may be set too low, or turned off. Or it may be wired wrong, although that seems unlikely. The second thermostat will be located either well above or below the first one, behind a different access panel. They should be on the same side of the heater, though - no need to turn it around to get at the second one. It is also possible to mis-wire the thermostat so that it doesn't accomplish anything at all; the power remains on to the element all the time. You might re-check your connections, making sure that the wire going to the element is terminated properly at the thermostat. I have replaced the thermostat and heaing element in my mobile homes water heater and the water is coming out scalding. I have turned the thermostate down to lowest setting and still scalding. I do not see that there are two of each on the unit. Can you suggest something else? You can try Amazon, or the manufacturer. Perhaps google the model number - there are often alternate sources providing other than original equipment. Where can I find a 110 volt thermostat for my Candle vats? That would be my guess. Both elements and thermostats can be checked for operation, but if the elements are new, best guess is thermostats. Changed both heating elements about 2 months ago and now no hot water again could it be the thermostats ? Sorry, Eilish, but i can't help you here. I'm just not familiar with the type of heater you have. First step is to find out where the water is coming from that is causing that rust. If that isn't stopped there is no reason to replace either the element or the thermostat as it will just rust over again. If you can find the leak and repair it you can probably salvage the tank. It will need cleaned, of course, and any rust inside drained out as well. Suggest you start with a careful examination of the area around the threads of the element. That's the most likely source of a tiny leak, and it's quite possible that a new element, properly installed, will eliminate the leak. Hi! My electric water heater is not heating. I opened up both top and bottom panels but that is as far as I have gone. Top looks fine but bottom is totally rusty. I'm wondering if replacing the element is recommended or if, because of the amount of rust, it is too far gone and replacing the entire unit is needed. Your advice is greatly appreciated! Check the breaker is on. Check the re-set buttons on the thermostat(s). Check the wiring is correct. i just ran water to do dishes,but there is no hot water now,it is a electric water heater... where should i begin first???? Have you set the thermostats to the proper heat? Try pushing the "reset" buttons on both. so i changed both the thermastats and the coils and it still not working. the sniffer says i have power every where what am i missing. Brown, I suggest that at this point you install the lower element you purchased and see what happens. While that figure is high, it is not impossible, and could be normal for your unit. If you still run out of hot water, replace the upper element as well. Hot water has been running out so I checked the upper element with multi device, the reading was over 20, lower element had no reading so I purchased a replacement element. With the upper element reading so high what did I do? Very sorry, but I'm not familiar with the product. how do you replace a URN THERMOSTAT SATCHELL GEYSER THERMOSTAT? Hi Patrick: if the breaker is blowing each time it is turned on either the wires are not put on properly, allowing a short somewhere, or the brand new element is bad. Check the wiring carefully, looking for anywhere two wires might be touching either each other or the metal frame. Neal, it sounds as if the upper thermostat is bad. Part of it's function is to supply power to the lower thermostat, and it isn't doing that. I'm not sure what you mean, however, when you say you have "delayed" both elements and thermostats. If you mean that is what you are seeing, you should not be. For whatever reason, the heating elements are not shutting off when they should; I would suggest that you need one or two new thermostats. Check them both for correct operation and replace as needed. If you find that elements are still on when the water is hot you need a new thermostat. If neither element is on when the water is overflowing, or the water out the overflow is only warm, you need a new safety valve.